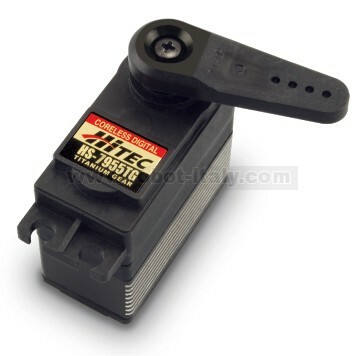 Hitec's best servo just got better. Based on the powerhouse HS-5955TG servo the HS-7955TG has the added benefit of our G2 second generation programmable digital circuit. Hitec's best servo just got better. Based on the powerhouse HS-7955TG servo the HS-7955TG has the added benefit of our G2 second generation programmable digital circuit. This new circuit has twice the resolution of our original circuit while adding programmable overload protection. The HS-7955TG has been designed for the most demanding hobby applications including the largest aircraft and monster trucks. Featuring a titanic 333oz./in. of torque at 6.0 volts, all this power is harnessed by incorporating the industries first Titanium gears for incredible wear resistance and two strong hardened steel gear pins and axial brass bushing in the servo case. 0.19 / 0.15 sec @ 60 deg.